For a time, the only place to see the Courthouse as it was was in The Bell County Museum in the form of a scale model. The Museum is in the beautifully restored Carnegie Library (c.1904) at 201 N. Main St. 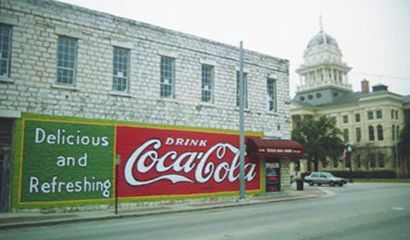 The museum also houses memorabilia from the administration of Miriam "Ma" Ferguson, Texas' first woman Governor. (Not one of Texas' best Governors, but the first who was a woman). 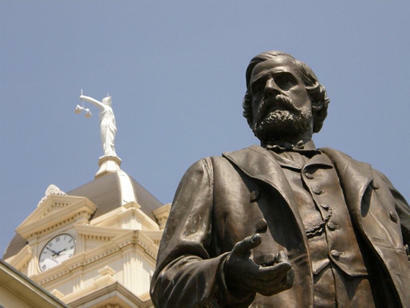 Both Belton and Bell County were named after Peter (I-might-just-be-a-Colonel-but-I've-got-a-Texas-County-named-after-me) Bell. Bell was a mere Colonel in the Civil War, but he was a Mexican War Veteran, and before that, a San Jacinto Veteran. In his spare time he was a Texas Ranger, a Congressional Representative and a Governor. 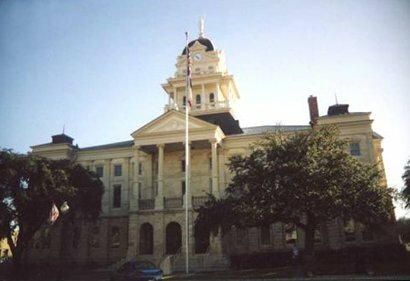 Belton is a little different from other County Seats, in that it hasn't the dominant population in the County. Belton's 18,878 are quite happy where they are and with Temple's 68,218 being where they are. The man who was born into slavery and went on to become a trusted friend of Sam Houston died in Belton on April 3, 1941. He was buried in the East Belton Cemetery. He is honored by two Texas historical markers; one at his grave site and one on the campus of the University of Mary-Hardin Baylor in Belton. "...That the James and Younger brothers spent some time in Texas is not in dispute, and local legends of the James and Younger brothers in Bell and surrounding counties abound..."
Lake Belton: N.W. of Belton. At nearby Lake Belton, you'll find the Miller Springs Nature Center, a non-profit, self-guided tour, located at Highway 2271 North of the Spillway. Open from dawn to dusk, 365 days a year. Stillhouse Hollow (Lake) : 6400 acres only 8 miles SW of Belton. Includes 5 parks. Someone just sent me the link for your web site, and I love it. I am passing it along to others. The article about Belton must have been written by Berneta Peoples. It has her writing style all over it, and I have loved her articles for years. On the other hand, the entire web site appears to have that touch of humor.